I have a couple of Twitter polls this weekend, and they focused on specific teams, Dallas and Detroit. The Stars made a lot of improvements this off-season, first and foremost of which was their new head coach, Ken Hitchcock. No slight against their last coach Lindy Ruff, who is now Alain Vigneault's assistant with the New York Rangers, but this is a huge upgrade. Based on my coaching metrics, which subtract a team's expectations (based on last year's standings) from where the team actually finished in the standings, Hitchcock is one of the most accomplished coaches of all-time. The Stars also invested over $20.8 million in cap space in four players. They certainly seem to address the team's needs, but that's a lot of money. 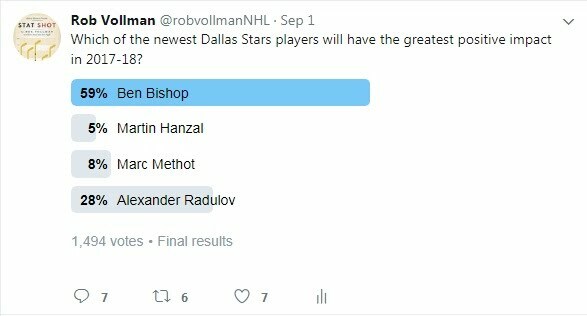 Based on about 1,500 votes on my first Twitter poll, most people feel that the goalie, Ben Bishop, will have the greatest impact. Given how awful the team's goaltending has been over the past few years, it's not a surprise to see Bishop top the list. If he can achieve even league-average goaltending, it will be a huge step up and possibly enough for this high-scoring team to win the division. However, Lehtonen and Niemi were both perceived to be roughly league-average goalies before they joined the Stars, and they weren't good enough, so it will be an uphill battle for Bishop. Obviously, the team's defensive play has to have been at least a minor factor in their underachieving goalies. Even to the eye test, they have had one of the league's worst blue lines for some time. It's hard to predict if Methot will help, because he was more of a No. 4 guy before joining Erik Karlsson in Ottawa, who has a habit of making his partners look like a million bucks. At age 32, he might go back to being just a No. 4 guy, or worse. However, the Stars do have a lot of young talent on that blue line that are now hitting their primes, between ages 23 and 25, just like John Klingberg. I mean, a lot. Between Esa Lindell, Stephen Johns, Julius Honka, Patrik Nemeth, and Jamie Oleksiak, there has to be at least a couple of players who step forward this year and start plugging those holes. If so, Bishop might do just fine. I'm sure Radulov will have a big impact, especially if he gets to play with the highly skilled Jamie Benn and Tyler Seguin. But, do they need more scoring? A lot of people would succeed on that wing. Martin Hanzal might be the more important player of the two, because he brings a more well-rounded game that can improve the team defensively. But, time will tell. I also published a poll on the Detroit Red Wings. Henrik Zetterberg just led the team in scoring for the fifth time in seven seasons, and by a whopping 20 points. But he's turning 37 on October 9. There has to be someone who will soon step up and overtake him as the team's scoring leader. But who? That's exactly what I asked Twitter, and here are the results (albeit with far fewer voters). It must have been a good question, because that's a very tight pack. Plus, according to the Sports Forecaster magazine, Larkin will actually finish last of these four, with 46 points. They have Mantha first, with 54. That sentiment is shared by the writers of the Athletic. Jack Han used my updated NHLe figures (among other stats) to demonstrate how Mantha has a higher ceiling than players like Drouin and Huberdeau, and it's hard to disagree with his logic. I mean, Zetterberg scored 68 points last year, which is bang-on with his five-year average (assuming he doesn't get hurt). If there's one player who has the upside to bust out past the 50-point range and exceed that, then it's probably Mantha. 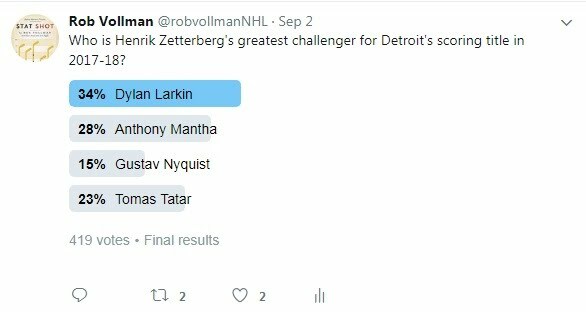 However, if Zetterberg slumps, and 55 points is enough to lead the team, then all bets are off, and it could be any one of these four players. The following two posts are from a week ago, but I just wanted to close by bringing a couple of interesting findings to light. The first one is by Sean Tierney, who figured out which teams employ 4 forwards and 1 defenseman on the power play (in yellow), and which teams still go with two defensemen (in blue). As you can see, the former is the norm, and LA, Minnesota, Montreal, Arizona, Anaheim, and Chicago are really the only six teams that go with two defensemen most of the time. Lastly, Don't Tell Me About Heart has apparently been digging into KHL data recently. He has the power rankings for their standings this season, and the monster St. Petersburg team is on top, even without Shipachyov and Dadonov, who signed with Vegas and Florida in the NHL, respectively. They still have players like Kovalchuk, Datsyuk, and Voynov, so they should be just fine!